The Omer count begins tonight! Chag sameach! I hope everyone had a sweet first night of Pesach last night, and I’m looking forward to celebrating with many of you tonight at our second-night community seder. Tonight we’ll begin the process of counting the Omer, the days between Pesach and Shavuot, between liberation and revelation. In an agricultural paradigm, this was the season of growing new grain to offer to God at the Temple on Shavuot, some seven weeks away. In today’s paradigm, we count the forty-nine days between one holiday and the next to keep ourselves mindful of the journey. Freedom is tremendously important, but it isn’t enough. In order for our freedom to have meaning, we also need to enter into relationship with something greater than ourselves. On Shavuot, when we celebrate the revelation of Torah at Sinai, we’ll celebrate our entering into covenantal relationship with the Source of All. Between now and then, each day offers us a special opportunity for contemplating where we are on the journey and who we are (and hope we are) becoming. 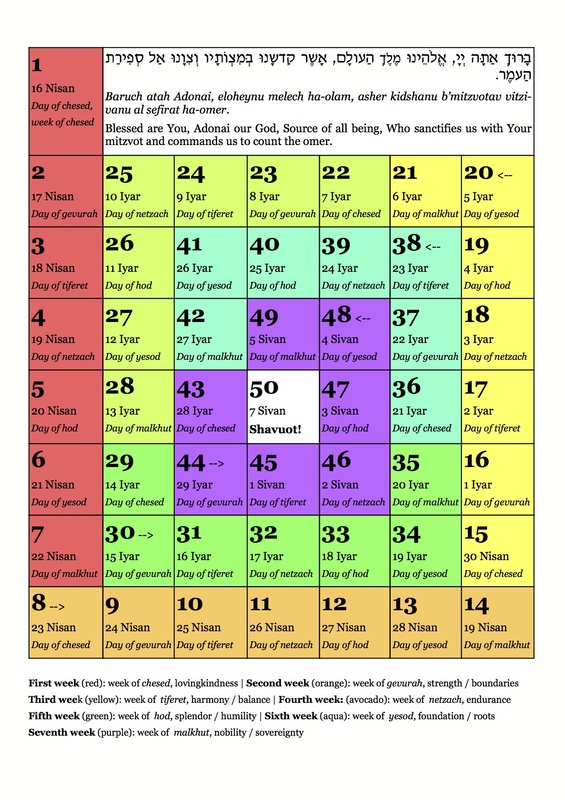 Here are four wonderful books for counting the Omer — they offer teachings, poems, meditations, and inspiration for each of the 49 days of this journey. Please consider picking one up and using it to enliven this special time of year! And if you’d like to receive daily emails, Facebook messages, and/or twitter reminders to Count the Omer (with beautiful meditations and teachings contained therein), you can sign up for a daily notification from Mishkan Shalom — I’ve been receiving their daily Omer emails for a few years, and they are wonderful. I wish all of y’all a sweet and meaningful Pesach, and a joyous and mindful journey through these seven weeks and into Shavuot. It’s hard to believe, but Pesach begins just one week from tonight! A reminder: if you are hoping to attend CBI’s second-night community seder (on Tuesday March 26) and have not RSVP’d, please do so immediately; we need to know how many people to prepare for. Here are a few pre-Pesach resources for you, followed by a short reflection on this special and sweet time of year. Looking for a short-and-sweet one-page ritual for Bedikat Chametz, the ritualized hunting-for, finding, and disposing-of the chametz (leaven) in your house before Pesach? You can find one here. If you’re feeling overwhelmed by the prospect of the Pesach dietary traditions, you might find comfort in my recent blog post Chametz. And finally: the Counting of the Omer begins on the second night of Pesach. Here are some Resources for Counting the Omer — a handful of truly wonderful books which will offer meditations, poetry, and wisdom for each day of the count. Each of us has experiences of constriction. Maybe it’s fiscal constriction; maybe it’s emotional; maybe it’s spiritual. Maybe it’s postpartum depression, or depression of some other kind. Maybe it’s sickness. Maybe it’s sorrow. Pesach offer us the opportunity to recognize, and celebrate, the Source of Life Who enlivens us and brings us out of those tight and painful places. 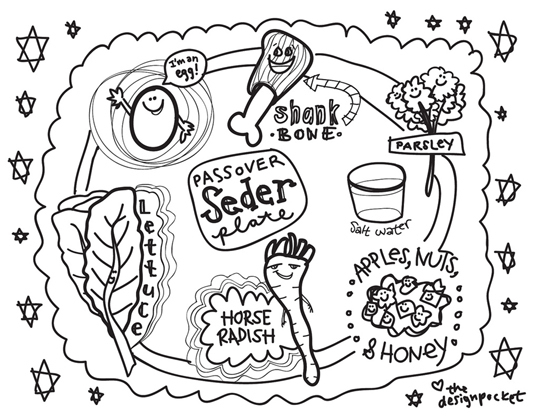 I love the many forms the seder takes. In my own lifetime I’ve moved from the familiar old Silverman haggadah, with its gendered God-language and slightly dated illustrations, to the Velveteen Rabbi’s Haggadah for Pesach (available for free download at velveteenrabbi.com!) which features poetry, original artwork, kabbalistic teachings and an orange on the seder plate. Each seder, anywhere in the world, is a variation on a timeless theme. There’s a Hasidic teaching which holds that on the first night of Pesach, we’re lifted up to elevated spiritual heights — we’re at the top of the mountain with God, as it were. The next day, we return to the valley again…but having experienced the heights, we have an impetus to make the arduous climb to get there again. The climb takes seven weeks: the duration of the Counting of the Omer. At the end of that time, Shavuot brings us once again to a spiritual peak. These rhythms of peak experience and then the slow climb back up, of festival and measured time and festival again, are woven in to the Jewish understanding of how the year unfolds. Each day we’re given a new opportunity to experience ourselves as having been brought out of Egypt, as being part of the covenant community which stands even now at Sinai in some ineffable way. And the festivals don’t pop up out of nowhere on our spiritual horizon; one leads to the next. By the time we finish these steps in our year-long festival dance, it will be almost summertime in the Berkshires — another of my favorite seasons, to be sure, though for very different reasons. I look forward to summer’s warmth and sunlight and greenery. But in some ways, the anticipation is the sweetest part: knowing that the days are getting longer, that the migrating birds will return to our trees, that the earth will green again. Spiritually, too, the anticipation can be the sweetest part. Shavuot will come, with celestial shofar blasts and a cosmic download of Torah directly into our hearts — but before it does, we get to savor the 49 days leading up to the holiday. The days of counting offer a chance to prepare ourselves to receive the blessings which are coming. I wish a a sweet (and meaningful) Pesach, and a joyful journey through the days of the Omer. See y’all at Sinai! This was published in the Berkshire Jewish Voice as a “Rabbi Reflections” column in 2012. This week as we begin the book of Vayikra, Leviticus, we enter into a mystical world of flour and oil, incense and entrails. We call these things sacrifices, though that English word misses the mark of what I think the Hebrew really means. The Hebrew word is קרבנות, which comes from the root which means to draw near. The korbanot are offerings intended to draw us near to God. Again and again in this week’s Torah portion we read that we are to make a ריח ניחח, a pleasing scent, to Adonai. I hear those words and I think of woodsmoke, fine incense, the mouthwatering aroma of good barbecue. Once upon a time we understood our korbanot as our way of putting something fragrant into the air for our invisible Deity to consume. I like to think of the reiach nichoach created by our choices. Think about how we behave in the world, how we treat one another, whether or not we take the time for the spiritual practice of mitzvot. Do our actions create a reiach nichoach, a sweet scent, for Adonai? One of the offerings described in this parsha is an offering of unleavened wafers spread with fine oil — what we might think of as fresh hot matzah with really good butter. Can we make our observance of Pesach, coming up in just a few short days, a korban, something which will draw us nearer to the Holy Blessed One? Can we set the intention of eating matzah that week with gratitude that we have this practice for remembering our story and celebrating our freedom? Can we make choices which will create a spiritual fragrance to waft up to God on high? I’ll close with a Torah poem for this week’s portion, which you can find in 70 faces, my collection of Torah poems, published by Phoenicia Publishing, 2011.
exactly as the directions teach. layer the hardwoods to burn. or pigeon, went up in smoke? sends a pleasing odor to Adonai. Join CBI for our second-night Community Seder, March 26! Celebrate Pesach: the Festival of our Liberation! Songs! Guitar! Good food! Friendship! Poetry! Stories! the Velveteen Rabbi’s Haggadah for Pesach. Please join us.